Get out of town with these interesting Seminyak side-trips: Ubud (Tegalalang Rice Terrace & Sacred Monkey Forest Sanctuary), Tanah Lot Temple (in Beraban) and Uluwatu Temple (in Pecatu). 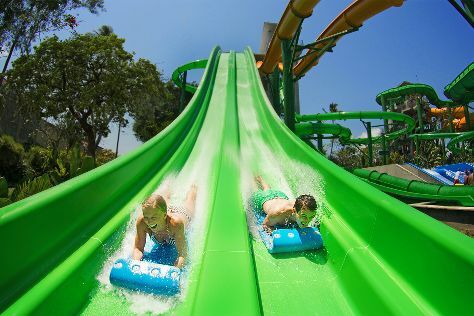 The adventure continues: cool off at Waterbom Bali, stroll through Kuta Beach - Bali, get outside with MOXX ! bodytec, and appreciate the history behind Ground Zero Monument. To see other places to visit, photos, where to stay, and more tourist information, refer to the Seminyak trip itinerary builder. Singapore, Singapore to Seminyak is an approximately 5.5-hour combination of flight and taxi. In May, plan for daily highs up to 36°C, and evening lows to 29°C. Cap off your sightseeing on the 19th (Fri) early enough to travel back home.